If you knew investment books could improve your life, would you take the time to read them? But I recently saw a study that pointed out that fewer people are reading books, especially in the retirement age bracket. Almost one in three adults aged 50 or older in the U.S. haven’t read a book within the last year, according to the Pew Research Center. If you’re walking life in the right direction, you should be reading more as you get older, not less. Why? Every book should teach you there’s more that you don’t know. As the host of the Retirement Answer Man Podcast, people often ask me about the investment books that have impacted the way I approach investing and retirement. I’ll give a fair answer. This won’t be the last time I do it, either. Today I’ll start recommending some investment books that deeply impacted the way I see investments, numbers and life. These investment books improved the way I view and do things, and it could do the same for you. That is, if you’re ready for a teacher to come into your life. This will be the first in a series of posts that will come out randomly over time about books that have improved my mind and changed the way I view the world. With that, enter the teacher…AKA book. I read this book during the technology bubble of the 1990s. While many people around me were taking risky chances on the “hot” technology stocks of the day, I was sort of a designated driver because of this book. Some clients thought I was a stick in the mud. With all the market sizzle, people thought I was crazy to sit out on most of the technology craziness at the time. So while others drank deeply of the technology boom, I politely sipped juice on the sidelines. Don’t get me wrong…I still enjoyed myself. It was a party after all. But still, I couldn’t help but realize that other financial planners were the life of the party while I was the wallflower. The people out in the middle of the dance floor definitely seemed to be having more fun at the time. Heck, for a while I was the life of the party too. I primarily traded technology stocks for a long stretch. Then I read this book and I started seeing things differently. The secret this book shares can be taken back to a tennis analogy that the author shares. In tennis, he says, you pool the most talented players in the world who are all at the top of their game and you have them compete against each other. Most shots are pretty great as far as you and I are concerned. If I played tennis against one of these people, I can almost guarantee the score would be 50-0 every set! Unless my opponent fluked a double fault somewhere. But tennis stars play against each other, not Roger Whitney. So the stakes are higher, and the talent cancels itself out between the talented players. With all that skill on one court, it’s not necessarily the best shots that win the game, it’s the worst shots that lose it. Winning is about avoiding unforced errors more than hitting the perfect smash hit along the fringe of the court. What’s tennis got to do with investing? Well, investors compete just as much as tennis stars do. Some try to find the edges, hit hard and hope to score a hit. What a smart investor really needs to do is keep the ball in play. So many people around me got buzzed on hot stocks, IPOs and chasing quick wealth in the 90s. But I ended up learning from this book a different, more intellectually robust way to tackle the investment process. And that made all the difference when the technology bubble burst. 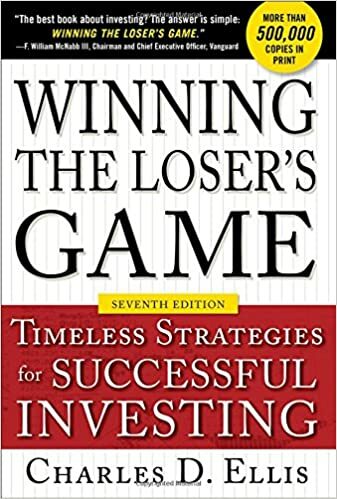 My personal evolution, largely because of this book, helped me save clients from the much of the decimation many people faced at that hard time in the investment markets. So many of us as financial advisors are just chasing our tails when we try to “out-talent” each other. We’re wired to take action when we can sense something cool is going on. But with a designated driver, you still get home safely and can go to the next party. I’m grateful this book taught me to be that driver. With things like what this book taught me, I can help you avoid unforced errors and focus on creating a great life in retirement. That’s my calling. My style of walking life with clients to find the best retirement possible isn’t for everybody, but what I’ve talked about today is only the beginning. Work with me and we can get started to see what’s best for you and your retirement. What book has had the most impact on your investment thinking and strategies? Why?